API Gateway supports a reasonable payload size limit of 10MB. One way to work within this limit, but still offer a means of importing large datasets to your backend, is to allow uploads through S3. This article shows how to use AWS Lambda to expose an S3 signed URL in response to an API Gateway request. Effectively, this allows you to expose a mechanism allowing users to securely upload data directly to S3, triggered by the API Gateway. The basic flow of the import process is as follows: the user makes an API, which is served by API Gateway and backed by a Lambda function. 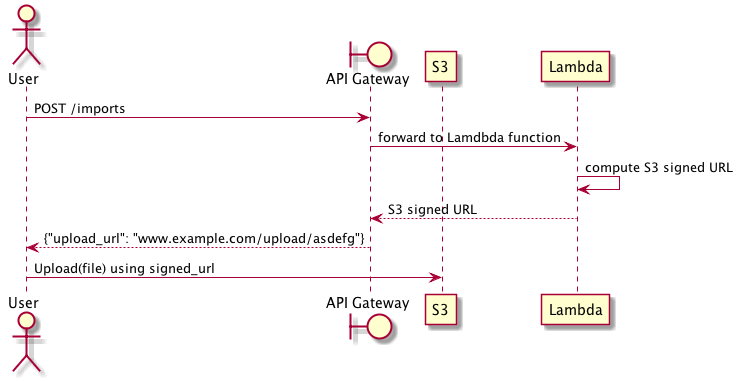 The Lambda function computes a signed URL granting upload access to an S3 bucket and returns that to API Gateway, and API Gateway forwards the signed URL back to the user. At this point, the user can use the existing S3 API to upload files larger than 10MB. In practice, implementing this idea requires several interconnected parts: an S3 bucket, a Lambda function, and the API Gateway. Let’s walk through how to create a working upload system using these components. First, we need an S3 bucket for storing our data. All objects in S3 are private by default and only the object owner has permission to access these objects. However, the object owner can optionally share objects with others by creating a pre-signed URL, using their own security credentials, to grant time-limited permission to upload or download the objects. We are going to take advantage of this feature to allow users to upload objects to an otherwise private S3 bucket. Second, we need a Lambda function that generates pre-signed URLs in response to user API requests. In this example, we will use the Python AWS SDK to create our Lambda function. Third, we need to expose our Lambda function through API Gateway. This requires creating a basic API that proxies requests to and from Lambda. We will define this API using Swagger and import it to API Gateway to start serving requests. The S3 bucket can be created via the AWS user interface, the AWS command line utility, or through CloudFormation. The only requirement is that the bucket be set to allow read/write permission only for the AWS user that created the bucket. This is the default set of permissions for any new bucket. Given your bucket name, you can test you have everything setup correctly by generating a pre-signed URL. In the following example, we use the Python AWS SDK (boto) to generate the signed URL and then use cURL to upload data using a PUT request. API Gateway expects responses to be returned as JSON, which corresponds to a Python dictionary. We can convert this simple test program into a Lambda function usable by API Gateway by returning the signed url as a JSON payload. Now, we can create the lambda function. Caution must be taken here: the IAM role assigned to the Lambda function must have read/write access to S3 so that it can create the signed URLs, and it must be assumable by Lambda. This implies the role must have the following policy granting access to S3. And the following trust relationship, which makes the role assumable by Lambda functions. At this point, we have an S3 bucket, and a Lambda function that creates signed URLs for uploading to that bucket. The last step is creating the API Gateway frontend that calls the Lambda function. For API Gateway to invoke a Lambda function, you must attach a role assumable by API Gateway that has permission to call Lambda’s InvokeFunction action. Now we can define the final API. It is fairly straightforward: we define a single API endpoint that integrates with the Lambda function we previously created, and that has the correct role for executing the Lambda function. This API returns the signed URL for uploading directly to S3. An import service for uploading data to an S3 bucket through a signed URL. description: A self-expiring signed URL for uploading files. summary: Create a new import job. You can use the AWS user interface to create a new API using this definition, and deploying it as an API stage. You can use the signed URL to upload data directly to S3.